Here I aaaammmmmm.... Grand Ballroom The Ritz-Carlton Pacific Place Jakarta. For me, this is a concert I wait the most. It had been delayed for A YEAR and SIX DAYS! Like I told you, my dear readers, I got the info of his concert since I walked out of the SAME ballroom, at Il Divo concert on September 2009. So you guys know how bad I crave for this moment. I even joined an Italian class at Instituto Italiano di Cultura a Jakarta from January 2010, just in case I can meet him at his concert. The thing was, the concert which was supposed to be on May 2010, was canceled! Then, after storms, rainbow comes. Few weeks ago I saw the announcement of his concert. I called the promoter, Java Festival Production, then I got the ticket. It costed me a whole bank, I'm telling you. 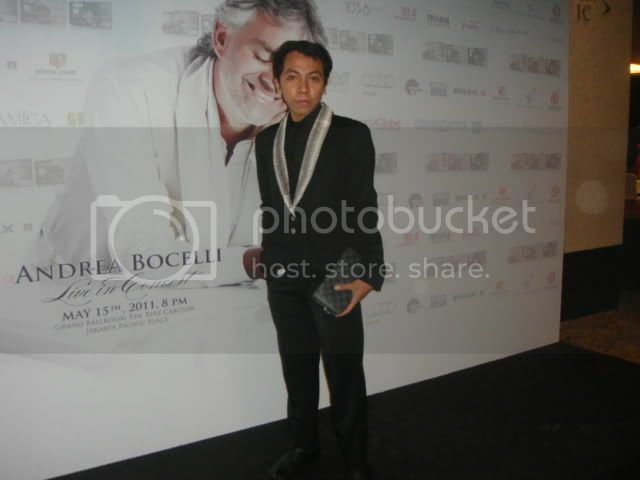 So here I am, Andrea Bocelli Live in Concert, The Ritz-Carlton Pacific Place, Jakarta. Worth every penny. Who said that money can't buy happiness? They just don't know where to go shopping and what to buy, then. Snake-collared Suit by Signorefandi, Skirt, tie, and shoes by Versace, wallet by LV. The concert? AMAZING. BEYOND. CLASSY. DISTINGUISHED. EXTRAORDINARY. FASCINATING. GREAT. HEAVENLY. INCREDIBLE. JEALOUS-MAKING. Just name it good, A-Z. I didn't take any picture during the show, because I think this concert must be enjoyed with both of my hands, my eyes, my ears, without being distracted by anything, including taking picture, or worse, video. I mean, what is the point of sitting in a concert if all what you do is holding your camera and rolling? Sad that many people do. They see concert in front of their eyes through their so-narrow screen; camera, Blackberry, iPhone, etc. Well, it's okay to take one. Or two. That's it. But for me, since this was the best thing that happened that night, I didn't want to waste it. Even a blink no. Yet, thanks to Mark Friend from AM Touring UK and Veronica Berti for inviting me to BACKSTAGE!!! 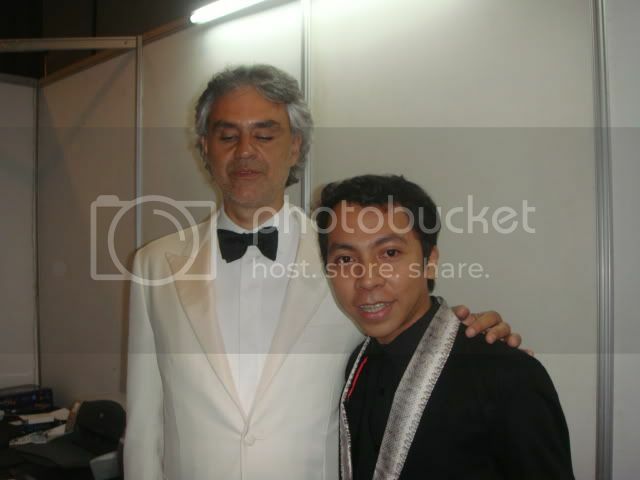 Signorefandi with Signor Bocelli, backstage after the show. I got an e-mail from Mark. I went backstage after the show. Then after being photographed with few people, Sg. Bocelli was led by Veronica and she asked me to follow them. I was sooooo nervous that I forgot ALL of my Italian ability (note: there's a time for tears after war. So never ever ever be nervous when it can ruin everything. Keep it for later). I mistakenly said "Come stai? ", which is not polite, then in one micro second I realized, correcting soon with "Come sta, Lei?". Mamma mia. Then we were near dressing room (I guess). Mark asked me, "So, you are the 20 year-old blogger?". Hehe. Yes. I'm the youngest in the whole room, I know. And probably who personally meet Sg. Bocelli too. And after Sg. Bocelli being photographed (again, this time with Signore Ambassadore Roberto Palmieri), I asked Veronica to take picture (I said it in Italian. YES!!!). Sg. Bocelli was led to one of the room, (where I followed him). Just four people inside. Veronica took picture of me and him. Thanks again, Veronica (she's really pretty in her red-dress. I need to ask her what she was wearing. Not to buy-then-wear it, of course. Just for info on my blog). Then I went out of the room. Thanking Veronica and Mark. Enjoying some (more) wine outside. Then waiting for the driver among many many many many (not complaining, just saying) well-dressed people and lavish car outside the Pacific Place Mall. 1. Ora sembra che la maggior parte dei miei amici sono interessati a icona della cultura pop. Come vede il futuro della musica opera, nei prossimi dieci o venti anni? 3. Quando è stata l'ultima volta che ha fatto qualcosa per la prima volta? What a night. I can say. Enjoy a lot. Listen a lot. Learn a lot. How he changes his so-called weakness to strength. Like I always say, being on the page of history. He does write. With gold ink. FYI, Andrea Bocelli will be performing in many other concert. The nearest one is in Taipei Arena, Taipei, Taiwan. You can get the ticket here. And in Beijing, China, in Masada, Israel, and in Siracusa, Italy.